As the days grow shorter, and my daily workload bulks up, I feel the rapid end of summer flowing into the ever so swift start of fall. And as much as I bemoaned the heat, I’m already pining for those long summer days. However, the silver lining in all this change is that there’s a whole new world of fruits and veggies to play with. 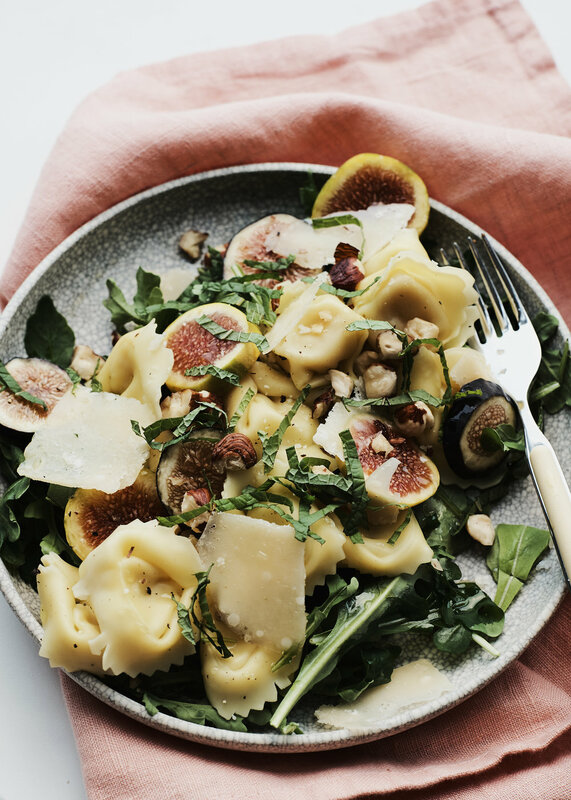 While most of the country is saying goodbye to summer tomatoes, they’re also saying hello to the many squashes, the apples and pears, and of course, the figs! We’re lucky enough in California to hold onto summer fruits and veggies a little longer than most, but it’s just as exciting to start playing with new ones! 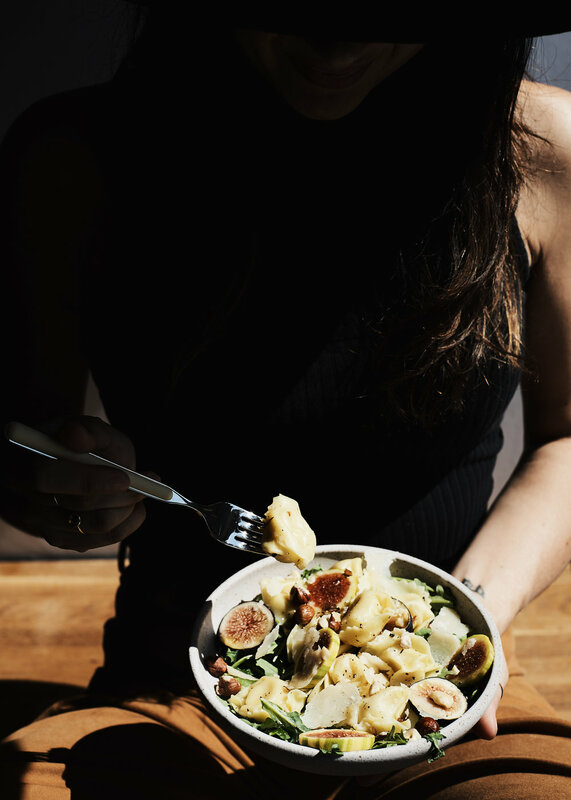 Between recipe testing, writing, shooting, editing, and all the other tasks that feed a cookbook, “normal” meals have taken a bit of a back seat. And by back seat, I mean that they rarely happen. Which is why whenever Moses (the bf), asks for a home-cooked meal, I gravitate towards pasta or salad, or in this case a pasta salad. Not sure if you remember, but earlier this year, we spent a few days in Verona, Italy with the Giovanni Rana family, learning all about their long legacy of pasta making (55 years!). As part of our trip, we toured their factory and tried all the fresh ingredients they put into their pastas on site, from the D.O.P. Genovese basil they source from Liguria, to the Parmigiano Reggiano imported from Northern Italy. And we fell in love with their pastas. Moses now asks me to pick up Giovanni Rana pasta, as in he yells, “Can you grab some ‘Rana’?” while I’m on my way out the door. This pasta salad is the perfect way to transition from summer to fall. It’s great for a weekday #notsaddesklunch, a quick weeknight dinner, or a perfect weekend picnic. Basically, it fits all occasions. And the best part is that it comes together in a matter of minutes. 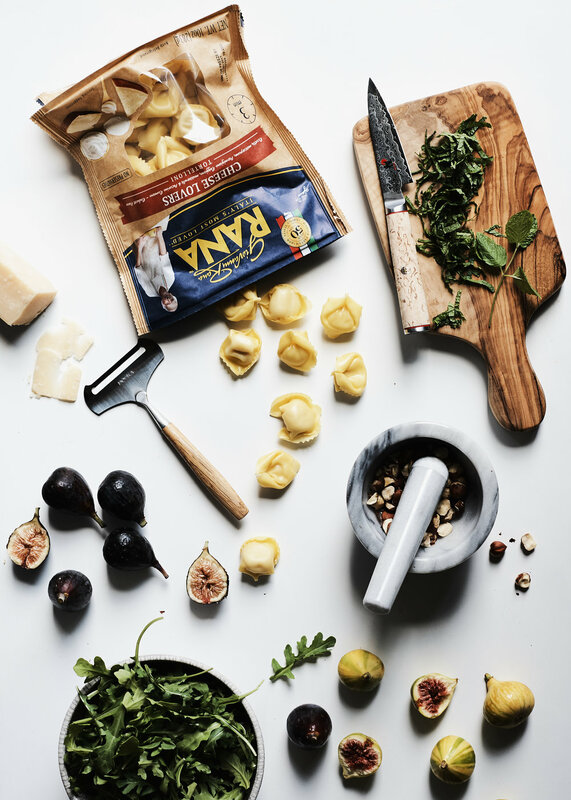 It’s literally just a bag of Giovanni Rana Cheese Lovers Tortelloni , figs, crushed hazelnuts, mint, arugula, shaved Parmigiano Reggiano, olive oil, and some salt and pepper, and yet it’s crazy good. If I’ve learned anything from our time in Verona, it’s that simple, good ingredients go a long way. Buon appetito! Cook the Giovanni Rana Cheese Lovers Tortelloni according to the package instructions. While the pasta is cooling to room temperature, gather and assemble the remaining ingredients. 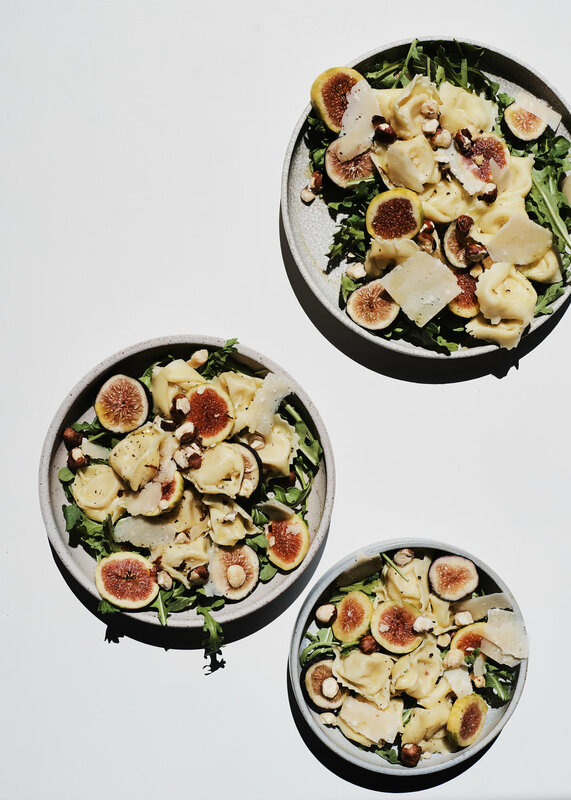 Once the pasta has cooled, toss all the ingredients together, excluding the arugula, in a large bowl, cover, and chill in the refrigerator until ready to serve. Serve over a bed of arugula and drizzle with a little more olive oil if desired. This post was sponsored by Giovanni Rana. I’m super pumped to be working with a company that values good ingredients as much as I do!